"We saved two months and $25,000 using Iron Speed Designer." Capital Farm Credit Loan is a complete enterprise solution created for Capital Farm Credit (CFC). CFC is an Agricultural Credit Association (ACA) and is part of the Farm Credit System. The ACA and Farm Credit System specialize in loans for farms, ranches, timberland, recreational property, and agribusinesses, as well as rural homes, agricultural equipment, livestock and agricultural operating capital. 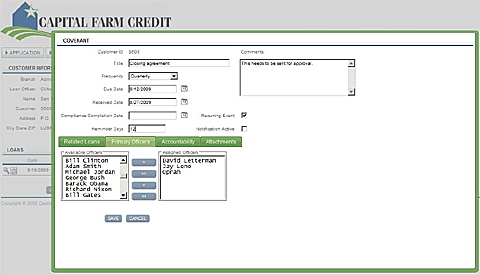 CFC Loan began with a basic Iron Speed Designer application. We incorporated a Microsoft Office 2007 Outlook add-in and a SharePoint web part to integrate the project into the client's internal SharePoint 2007 environment. The app is used strictly by our outside client, across different business units within the organization. It is used by senior management, lending, appraisal and loan/processing/servicing staff, and compliance officers. 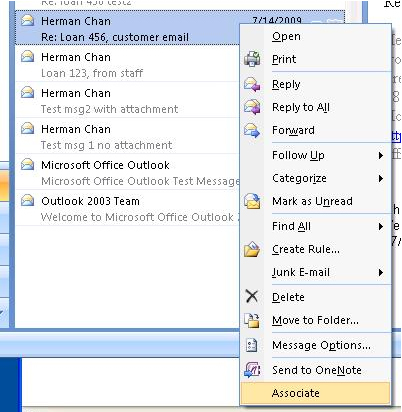 The Microsoft Office 2007 Outlook add-in inserts an associate context menu from the inbox to give users easy access to tag and save an email. The application answers the company's compliance to the latest regulations governing the financial industry. It improves the efficiency of record keeping and eliminates navigation with a SharePoint-integrated Iron Speed Designer Loan application. The Outlook 2007 Add-In lets users easily "tag and save" an email from their inbox into the loan database on SQL Server 2005. It also enables the user to identify whether the email should be associated with a customer or a customer's specific loan(s). In our client's environment, SharePoint 2007 has been adopted as the loan document management platform; our custom-built borrower web part is for easy querying, filtering, and displaying loan documents. CFC Loan is used internally by loan officers to manage the loans and provide loan services to borrowers. Custom pages allow users to view and download emails tagged from the Outlook Add-In, manage associated loan covenants, and add and retrieve related documents stored within SharePoint directly. There are benefits associated with using SharePoint as the document repository, such as security and scalability. By integrating its document-managing functions with our Iron Speed Designer loan application portion, users are able to view those documents within the context of the loan. This integration brings more efficiency to the business routine and allows users to access all information they need within one application. Users access this screen to save customer or loan information to the associated item. The life cycle of a loan involves multiple professionals and a series of steps including processing, underwriting, closing, and ultimately servicing the loan. There is a lot of communication going on, including inquiries and verification. Under the latest industry regulation, some communication needs to be recorded for audit purposes. Traditionally, this could be accomplished by copying and pasting the email text into a separate Word document or copying it into another application. However, besides being time-consuming, this multi-step procedure is error prone. Our Iron Speed Designer solution puts a context menu item right in user's email inbox and lets them "tag and save" an email with ease. It displays a loan selection screen for the user to associate this email appropriately and save to the database. On a typical business day, when there are many inquiries from different customers and internal departments on various loans, this solution has proven to save myriad steps in the process and improve accuracy for audits. 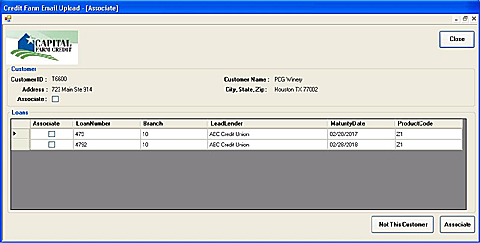 Customers access a central portal screen to view tagged emails, covenants, SharePoint correspondence along with their loan. Clicking the email view icon will download the Outlook 2007 email in its native .msg format. To answer inquiries from customers, loan professionals need to look at correspondence from different stages of the loan cycle. Since some of the customers may not have access to the loan application, those users will access the SharePoint site directly to review this correspondence. Although our client has already structured their document repository in a very organized fashion, SharePoint has some innate out-of-box limitations. The documents or folders cannot be easily queried from a business perspective. Our borrower web part tackles this issue by providing an easy-to-use user interface that exposes various commonly used attributes for users to access their target correspondence quickly. The Iron Speed Designer portion of CFC Loan is the main business system our client uses to keep track of various facets of information revolving a loan. It houses loan applications, amount approved, appraisals processed, customer information, and email records. It dynamically pulls SharePoint correspondence. Mortgage bankers, customer service representatives, loan servicing staff, and the company's upper management from marketing, operations, and strategy units log in at different times to monitor the business and review reports from the receipt of a loan application to its being approved to its servicing stage. Email notifications remind appropriate personnel of next steps and loan covenant due dates as they approach. Instead of going to a different page, users add and edit a covenant in a pop-up panel, enabled by using Telerik RadWindow. In some child tabs, the approach utilizing left and right list boxes lets users select child entities in a much easier manner. CFC Loan was an existing application to which we added functionality with Iron Speed Designer. It utilizes two Microsoft SQL Server 2005 databases, 65 tables and 42 database views. The largest database tables are the Loan table and the Customer table. They contain approximately 70,000 and 200,000 records, respectively. There are approximately 100 web pages in the application, and we estimate that more than 250 users access the application per month. The Iron Speed Designer portion, which added functionality to an already existing application took three months to complete, using two full-time developers. It took us about 10 weeks to write the code customizations. We also used a third-party component, Telerk RadWindow. While we did not create an application-specific design theme, we did change the Adams theme header and footer. We also made page customizations by rearranging panels and creating new tabs for easy access to information. The Documents tab utilizes an Iron Speed Designer ShowTable grid to access a dynamic SharePoint document library. Users can also upload documents directly into the SharePoint environment in the appropriate loan folder by clicking on the New icon and using an upload page. We saved approximately two and a half months of work and $25,000 by using Iron Speed Designer. While the project was feasible without Iron Speed Designer, it would have taken more than six months, and there would have been no easy way to refresh the code when the database schema changed. We are working with Capital Farm Credit to deploy the application to several additional business units, adding hundreds of new users. We've continued adding features to the application to enhance the user experience. Soon the application will support additional SharePoint features including: tree-views, tagging and reminder email subscriptions. Herman Chan, PMP, MCAD.NET J2CP, is the founder of Presence Consulting Services. His technical skill set ranges from Java to .NET, and he works regularly with Oracle and Microsoft SQL Server databases. Herman earned his BBA from the University of Texas at Austin. He has worked in the oil and gas industry as both a technical consultant and a software engineer. Herman also worked as the technical architect at an eLearning company which launched character education modules in more than a hundred schools across the United States. He currently leads and manages various technical projects with a consulting, service-oriented approach.